We all know how beautiful a real wood flooring looks but they are not suitable in rooms that get wet such as the bathroom. 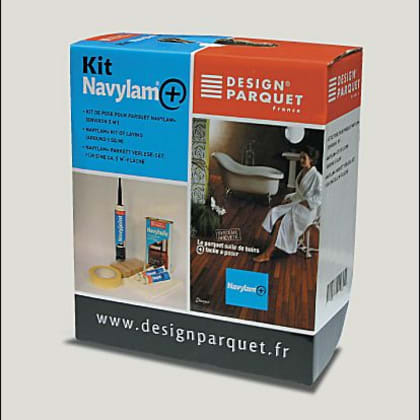 We have partnered with French firm Design Parquet to offer you Navylam+ a revolutionary new wood flooring that is suitable for use in the bathroom and wet rooms. Their unique system now allows you to have the bathroom wood flooring that you have always wanted. 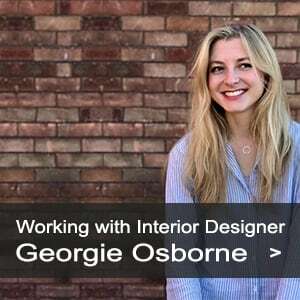 If you want to make an impression and have something not many people have in their home. The flooring comes as pre-oiled engineered parquet strips from 68mm to 136mm width in a number of exotic woods including Acacia, Doussie, Iroko, Mutenye, Teak and Wenge to further ensure your bathroom floor has a unique look. 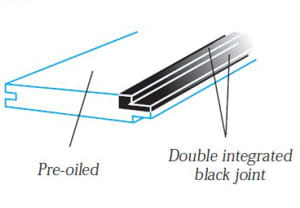 It is waterproofed with the help of a double integrated rubber ingress between the planks that also helps to make the flooring slip resistance. It is possible for you to use normal engineered wood flooring in the bathroom (it is not advised to use solid) but it is not easy and can get slippy when wet. 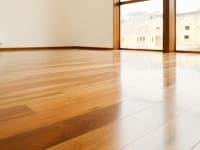 The flooring will need to be finished with lacquer or hard wax oil and even with engineered there is a good possibilty the humidity will mean the wood will expand and contract potentially damaging the boards. 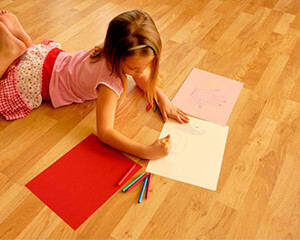 Laminated flooring also suffers from the same problems. 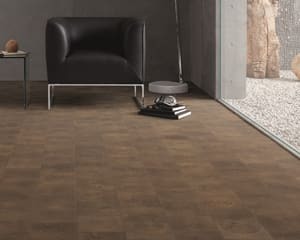 Our bathrooom wood flooing from design parquet comes pre oiled with a rubber seal that helps with waterproofing and also makes the floor slip resistant. 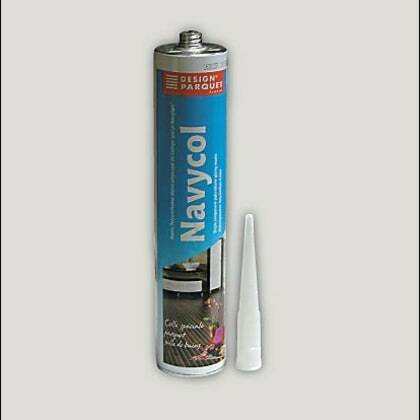 These Navylam+ flooring products have been specifically designed for use in room with high humidity and, when installed with the Navylam+ Installation Kit, comes with a 10 year guarantee. Installation is also made easier with this system. 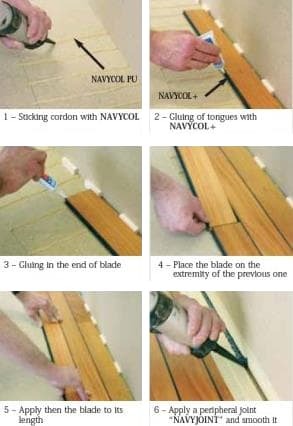 There is no sanding, oiling or joint laying, you simply use the specialist Navycol+ transparent glue to the integrated groove joints on each board and you are done. We suggest using a proffesional floor installer for the perfect fit but this system is easy enough for an reletively handy amature to install themselves. Sub-floor: It must be according to the actual DTU-norm. 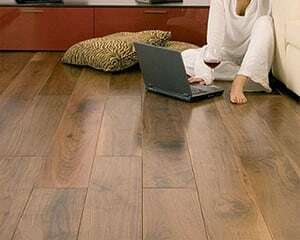 You must take care to have a perfect flatness because planks are pre-finished product, so it does not need to sanded after laying. Packages must be opened prior to install to ensure better stabilization due to the hygrometry of the room. The hygrometry during the laying must be stable and between 45% and 65%. The dampness of the mortar or concrete support must be equal or less than 3% at a depth of 2cm. For others, refer to the technical application document, all information about dampness are specified. 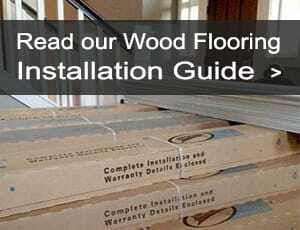 The heating system must be put on few days before laying your wood flooring (see DTU 51.2). If it exceeds 3%, use ISO ALU TB (be careful, it is not compatible on a heated floor). If it is laid on underfloor heating the dampness of the support must be less then 2% and for anhydrite screed, less than 0.5%. Laying: We recommend that before you to glue any strips of parquet that you mix the planks every 3 rows to harmonise colours and prepare your sections. After that draw a line on the floor to delimit the surface to glue. Take out the strips/planks in to the right order and apply glue per plank and in order. Begin the laying of your bathroom parquet flooring, do not forget to allow an expansion gap around around the edge of a minimum 5mm all around your room for expansion. For the first line, the groove is on the wall side and the tongue with the Navycol+ and also in the end of the blade. 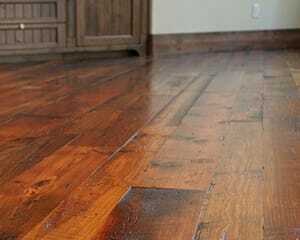 If the glue overflows on the wood flooring, clean it immediately. Continue to lay with the same process. The next step is the expansion joint. 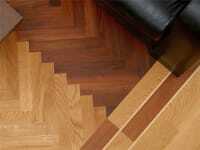 Before you begin protect your parquet flooring in the sticking an adhesive all around your room in peripheral. Run the Navyjoint and smooth it with a spatula. Remove the adhesive and let dry. 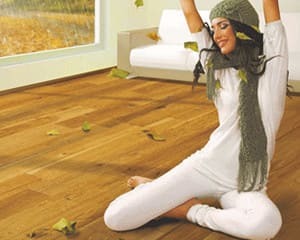 Finishing: After laying , clean the wood flooring with a cloth that is slightly wet. Then apply with a rag one or two thin coats of Oil (Navyhulle), it is the same oil that is used for maintenance. Do not let the oil get on the joints. 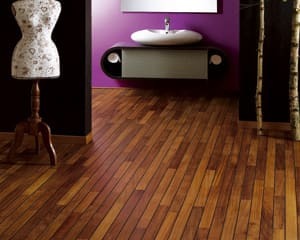 Navylam+ bathroom flooring can be cleaned easily. To renovate your bathroom wood floor we advise to use the spray Navyhuile (available from Maples & Birch) and wipe with a clean moist cloth. it is that easy. As long as you keep you floor cleaned and maintained you can have a beautiful wooden floor in you bathroom for years to come. 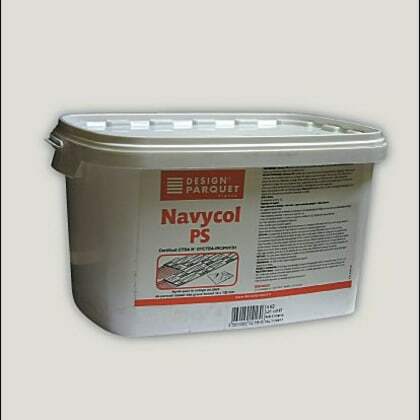 There are also a number of other maintenance and installation products available specifically designed for Navylam+ in our Bathroom Flooring Accessories category. Iroko is bright and light in appearance, its oily texture made it a great product for boat building so what better species to use for Navylam+. Its appearance will vary from rich medium brown to some darker patches with an interlocking grain which allows for a hardwearing surface, Iroko is suitable for suitable use in wet areas due to its genetic make up and is truely enhanced with the use of a unique integral joint and oiled finish. NAV003 Certain exotic wood species have natural moisture repellant genes and Iroko Navylam+ is a unique wood floor parquet system for use in your bathroom or wet areas which is easy and fast to install. Each strip is pre-oiled with a double integrated joint and is pre-sanded before initial oiling, you just apply Navylam Water Tight Sealant* in to the integrated tongue and groove joints of each parquet strip then apply the Navylam Top Oil* so your parquet floor is completely wa..
Doussie is bright and light in appearance, its exotic bronzed colour tone with lighter hues and subtle enhanced grain and has a natural interlocking grain which allows for a hardwearing surface, Doussie is suitable for use in wet areas due to its genetic make up and is truely enhanced with the use of a unique integral joint and oiled to finish. NAV002 Certain exotic wood species have natural moisture repellant genes and Doussie Navylam+ is a unique wood floor parquet system for use in your bathroom or wet areas which is easy and fast to install. Each strip is pre-oiled with a double integrated joint and is pre-sanded before initial oiling, you just apply Navylam Water Tight Sealant* in to the integrated tongue and groove joints of each parquet strip then apply the Navylam Top Oil* so your parquet floor is completely watertight and looking unique. Oiled Exotic Hardwood License Certified Source..
Mutenye is varied to medium to light in appearance, with distinctive darker colour tones and subtle ligher streaks and natural interlocking grain which allows for a hardwearing surface, Mutenye is suitable for suitable use in wet areas due to its genetic make up and is truely enhanced with the use of a unique integral joint and oiled finish. NAV004 Certain exotic wood species have natural moisture repellant genes and Mutenye Navylam+ is a unique wood floor parquet system for use in your bathroom or wet areas which is easy and fast to install. Each strip is pre-oiled with a double integrated joint and is pre-sanded before initial oiling, you just apply Navylam Water Tight Sealant* in to the integrated tongue and groove joints of each parquet strip then apply the Navylam Top Oil* so your parquet floor is completely watertight and looking unique. Oiled Exotic Hardwood License Certified..
Acacia is bright and light in appearance, its distinctive light golden colour tone with subtle golden streaks and natural interlocking grain which allows for a hardwearing surface, Acacia is suitable for use in wet areas due to its genetic make up and is truely enhanced with the use of a unique integral joint and an oiled finish. NAV001 Certain exotic wood species have natural moisture repellant genes and Acacia Navylam+ is a unique wood floor parquet system for use in your bathroom or wet areas and is easy and fast to install. 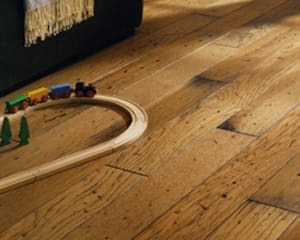 Each strip is pre-oiled with a double integrated joint and is pre-sanded with initial oiling, you just apply Navylam Water Tight Sealant* in to the integrated tongue and groove joints of each parquet strip then apply the Navylam Top Oil* so your parquet floor is completely watertight and looking unique. 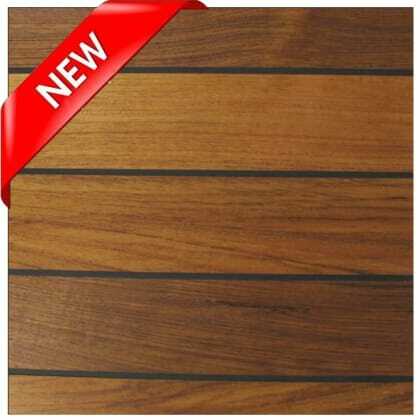 Oiled Exotic Hardwood License Certified Sourced Integrated Black Rubber J..
Teak is varied in appearance from golden honey-brown, Teak was and is still used for boat building so what better species to use for Navylam+. Its appearance with darker streaks and a straight grain allows for a hardwearing surface, Teak is suitable for use in wet areas due to its genetic make up and is truely enhanced with the use of a unique integral joint and oiled finish. NAV009 Certain exotic wood species have natural moisture repellant genes and Teak Navylam+ is a unique wood floor parquet system for use in your bathroom or wet areas which is easy and fast to install. Each strip is pre-oiled with a double integrated joint and is pre-sanded prior to initial oiling, you just apply Navylam Water Tight Sealant* in to the integrated tongue and groove joints of each parquet strip then apply the Navylam Top Oil* so your parquet floor is completely watertight and looking unique. Oiled Exoti..
Teak is varied in appearance from golden honey-brown, Teak was and is still used for boat building so what better species to use for Navylam+. Its appearance with darker streaks and straight grain allows for a hardwearing surface, Teak is suitable for use in wet areas due to its genetic make up and is truely enhanced with the use of a unique integral joint and oiled finish. NAV005 Certain exotic wood species have natural moisture repellant genes and Teak Navylam+ is a unique wood floor parquet system for use in your bathroom or wet areas and is easy and fast to install. Each strip is pre-oiled with a double integrated joint and is pre-sanded before initial oiling, you just apply Navylam Water Tight Sealant* in to the integrated tongue and groove joints of each parquet strip then apply the Navylam Top Oil* so your parquet floor is completely watertight and looking unique. Oiled Exotic..
Teak is varied in appearance from golden honey-brown, Teak was and is still used for boat building so what better species to use for Navylam+. 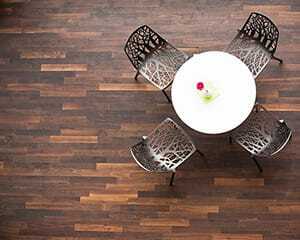 Its appearance with darker streaks and a straight grain allows for a hardwearing surface, Teak is suitable for use in wet areas due to its genetic make up and is truely enhanced with the use of a unique integral joint and oiled finish. NAV008 Certain exotic wood species have natural moisture repellant genes and Teak Navylam+ is a unique wood floor parquet system for use in your bathroom or wet areas which is easy and fast to install. Each strip is pre-oiled with a double integrated joint and is pre-sanded prior to initial oiling, you just apply Navylam Water Tight Sealant* in to the integrated tongue and groove joints of each parquet strip then apply the Navylam Top Oil* so your parquet floor is completely watertight and looking unique. Oiled ..
Wenge is distinctively dark in appearance and very classy It has a dark brown colour tone with paler veins and its natural straight grain allows for a hardwearing surface, Wenge is suitable for use in wet areas due to its genetic make up and is truely enhanced with the use of a unique integral joint and oiled finish. NAV006 Certain exotic wood species have natural moisture repellant genes and Wenge Navylam+ is a unique wood floor parquet system for use in your bathroom or wet areas which is easy and fast to install. Each strip is pre-oiled with a double integrated joint and is pre-sanded before initial oiling, you just apply Navylam Water Tight Sealant* in to the integrated tongue and groove joints of each parquet strip then apply the Navylam Top Oil* so your parquet floor is completely watertight and looking unique. Oiled Exotic Hardwood License Certified Sourced Integrated Blac..